The Wood Duck is a striking, colorful bird that is one of only a few ducks that have claws on their feet, allowing them to perch in trees. Birdwatchers and game bird hunters alike take pleasure in this unique creature. The Wood Duck (Aix sponsa) is a flamboyant and colorful species of North American waterfowl. 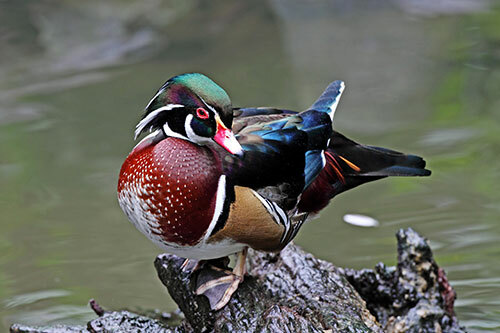 American Expedition is proud to present information, interesting facts, beautiful artwork, and colorful photos of the Wood Duck. The wood duck is also known as the Carolina Duck. The male (drake), with its iridescent green and purple head and bold white striping, is much more colorful than the female (hen). The female has a gray-brown head and a brownish-green neck and body. These ducks are medium-sized, typically measuring about 19 inches long with an average wingspan of 29 inches. They weigh 2 pounds or less; the hen being a bit smaller than the drake. Looking for Hunting Decor? Find unique Hunting Decor Ideas in our wildlife store. The wood duck is one of only a few American ducks that can perch and nest in trees. They will also use man-made nesting boxes in areas where tree cavities are scarce. They tend to build their nests within one mile of a lake shore, river bank, or other body of water. 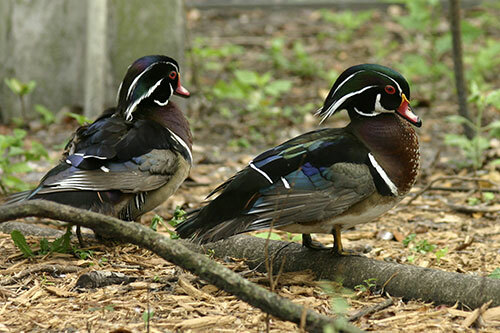 Wood ducks are monogamous birds that form pairs in January and mate in the spring. The male tries to impress the female and if she is stirred she will follow him. A clutch usually consists of 6-16 white eggs. The hen lays one each day and incubates them for about 27 days. Just before they hatch, the drake will leave the nest. The day after hatching, the ducklings must jump down to the ground from the nest tree and follow their mother to water. The ducklings are able to jump from heights of up to 300 feet without suffering any injury. They do not begin to fly until after their mother has left (8-9 weeks). Wood ducks live about 4 years in the wild. Wood ducks measure on average around 3 feet long. Wood ducks are shy and skittish by nature. Wood ducks can fly 30 miles an hour. The wood duck was once brought to the brink of extinction in the early 1900's, but numbers have significantly rebounded since. 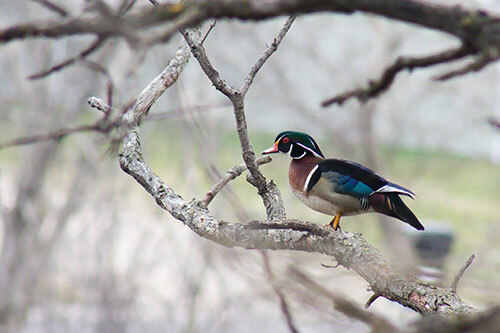 Wood ducks like to nest in dead, rotted out trees where they can find a nest cavity. Female wood ducks will line their nest with soft down feathers taken from her breast. Female wood ducks will often lay their eggs in another wood duck's nest cavity and leave the offspring to be raised by another wood duck. Wood ducks will typically lay around 10 eggs per clutch, but much higher numbers have been found as a result of 'egg-dumping' by other females. Wood ducks prefer to find nest cavities high in trees. Typically, these cavities are formed when a high branch breaks from the tree and the wood has rotted. Wood ducks are dabblers, which means they take short, shallow dives in order to find food. 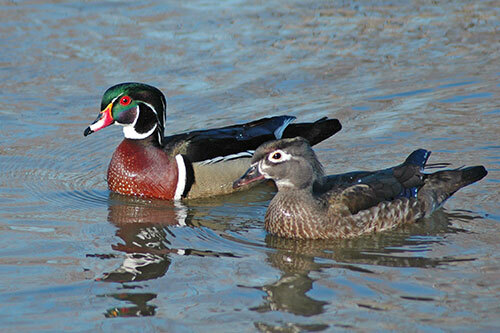 Wood duck males will court females by swimming before them with their wings and tail elevated. Wood ducks are not very vocal and generally only produce a whistling sound once in a while. Molting for wood ducks begins in mid-summer. Looking for Rustic Cabin Decor? 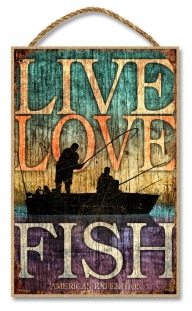 Find unique Cabin Wall Decor in our wildlife store. 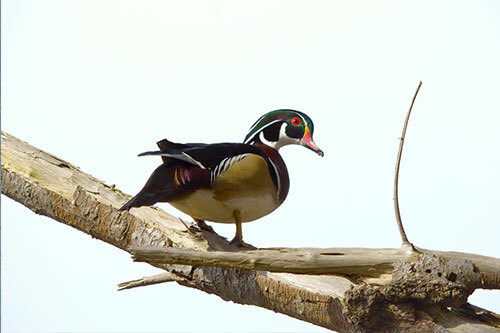 To attract wood ducks, make a wood duck nest house out of wood and hang it on a tree near water. This will attract ducks to your area. Wood ducks are the only North American duck that regularly produces two broods in a single year. Wood ducks can be found throughout most of the United States, the southern edge of Canada, and parts of Mexico in the winter. These ducks are permanent residents in many southern states, but in northern states they will migrate to the south for the winter. They rest high in trees in wooded swamps, lakes, streams, and ponds. Wood ducks feed on berries, nuts, and seeds and also eat insects and invertebrates. “Dabbling” is the most common method of feeding. This is where the duck sticks its head under the water to get food. 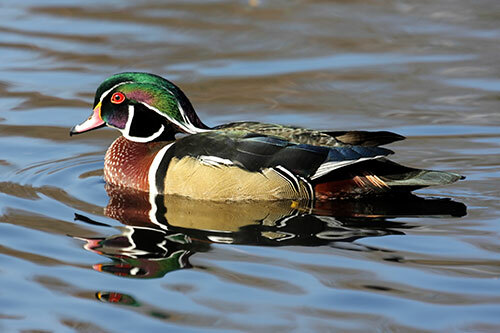 Wood ducks are the second most popular game bird in the United States (the Mallard is first). Get to the blind pre-dawn. Although patterns vary in different areas, the ducks usually start flying at daybreak. Don’t forget a shotgun and shells! Setting up decoys on the hunting ground is the key to attracting ducks your way. Ducks have excellent eyesight, so sit or lay in a camouflage blind in order to stay hidden. Use duck calls to lure the birds in. It is important to practice calling because ducks possess outstanding auditory perception. If the sounds you are making do not match what the duck actually sounds like, they will change direction and not land on your water. Some hunters have trained dogs, usually labs, to fetch the ducks after shooting them. Dogs are a great asset because most of the time the ducks will fall into the water, where you would then have to either use a boat or wade in to get them. It is important to train the dog to be well behaved while in the duck blind. An antsy or noisy dog will result in an unsuccessful hunt. It is more challenging to hunt in late season. Ducks are intelligent birds, so they become suspicious of decoys and calls. Collect the dates of waterfowl season. Hunting off-season is illegal and can result in a fine, the suspension or loss of equipment, or even jail time. Check your state laws to find what permits you need to have in order to hunt ducks. Most states require a small game permit, a state migratory bird permit, and a federal bird hunting stamp. Along with these, you must also have a hunting license. It is illegal to hunt without these. Shop for Waterfowl gifts in our wildlife store. 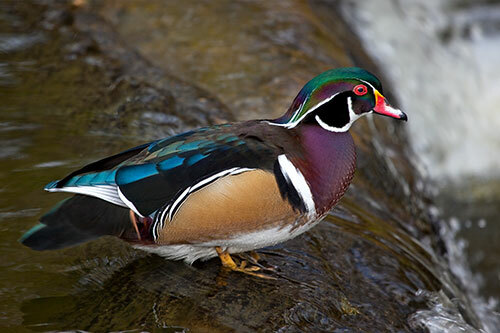 Male wood ducks have very colorful iridescent plumage. Females are less colorful with a white eye-ring. 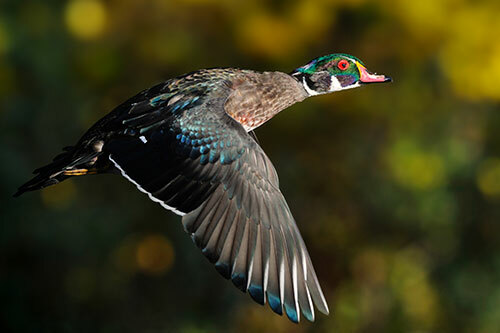 Wood ducks can fly at speeds of up to 30 miles per hour, and have a wingspan of 26-30 inches. The wood duck is also known as the Carolina Duck. Wood ducks have claws on their feet, which allow them to perch in trees. Wood ducks feed on berries, nuts, and seeds and also eat insects and invertebrates. 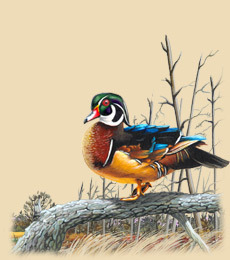 Interested in Wood Duck Gifts & Decor? Visit the Wood Duck section of our wildlife store!